If you’re a regular follower to this blog, you would have already noticed that I like to top a lot of dishes with creamy, buttery avocados. Not only do avocados taste great, but they are also highly nutritious and have proven health benefits. I often dress my avocados in a bit of olive oil, lime juice, and salt. It’s a fantastic topping! Palak daal (spinach and lentils) is a nutritious and comforting dish often made with skinned and split urad daal. For context, Daal Makhani, the recipe I recently shared, is made with whole urad daal (black lentils) that are creamy white on the inside. 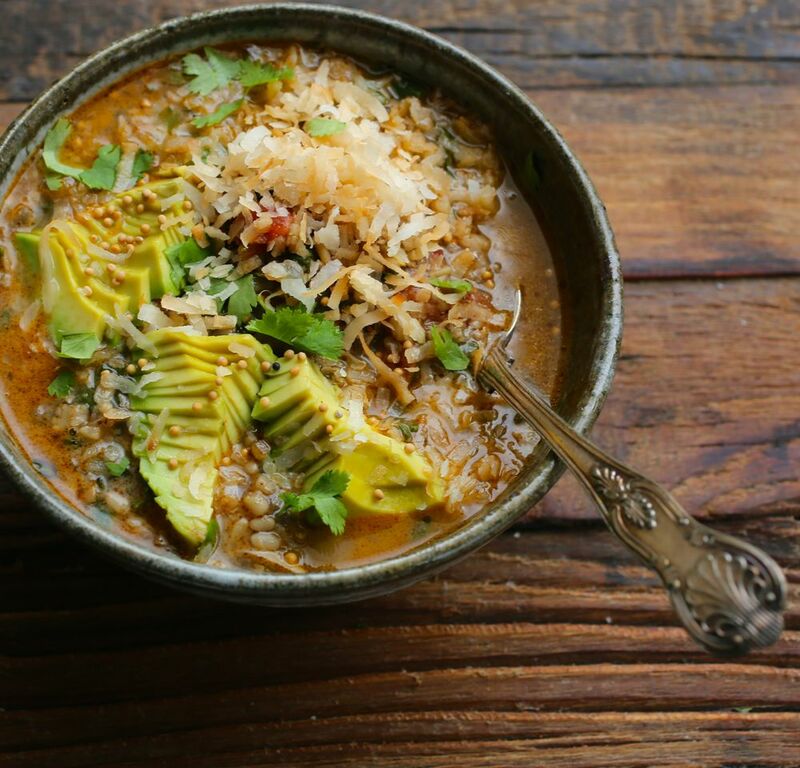 Their black skins give dishes a strong, earthy flavor, while the skinned and split urad daal (see photo below) are more mild. 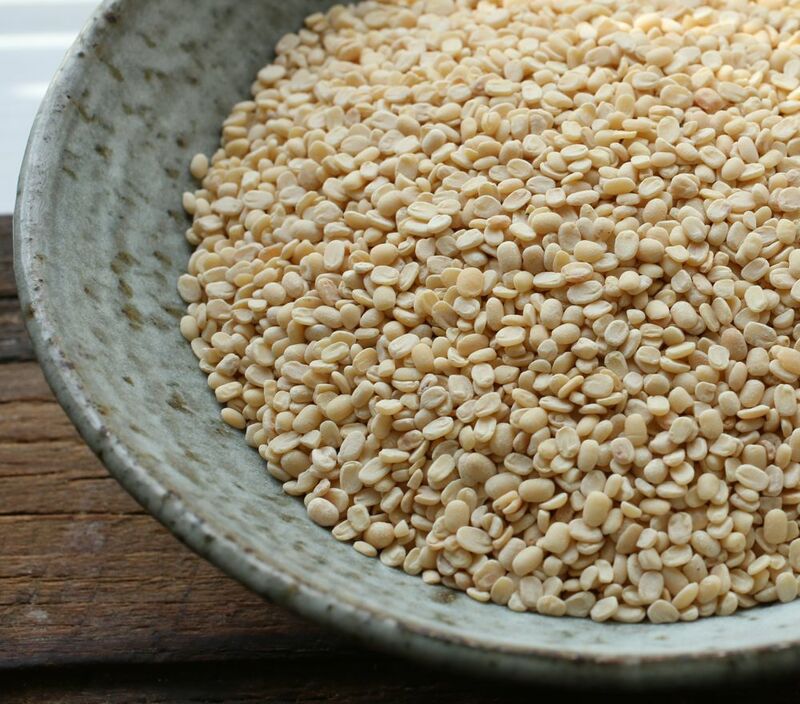 The split ones, also know as ivory lentils, don’t require soaking and don’t hold their shape as well, yielding a creamier consistency. I bought my daal at an Indian grocery store. If you can’t get a hold of split urad daal, try using yellow split peas, mung beans, or experiment with other lentils. There are several different ways to make palak daal and I’ve tried a few of them. One way includes the use of asafetida (also known as hinge)—a spice that has a strong smell, but when heated in oil or ghee it delivers a smooth flavor and acquires a taste and aroma reminiscent of sautéed onions and garlic, or leeks. In this recipe I don’t use asafetida, but if you would like to try it, see my notes below. 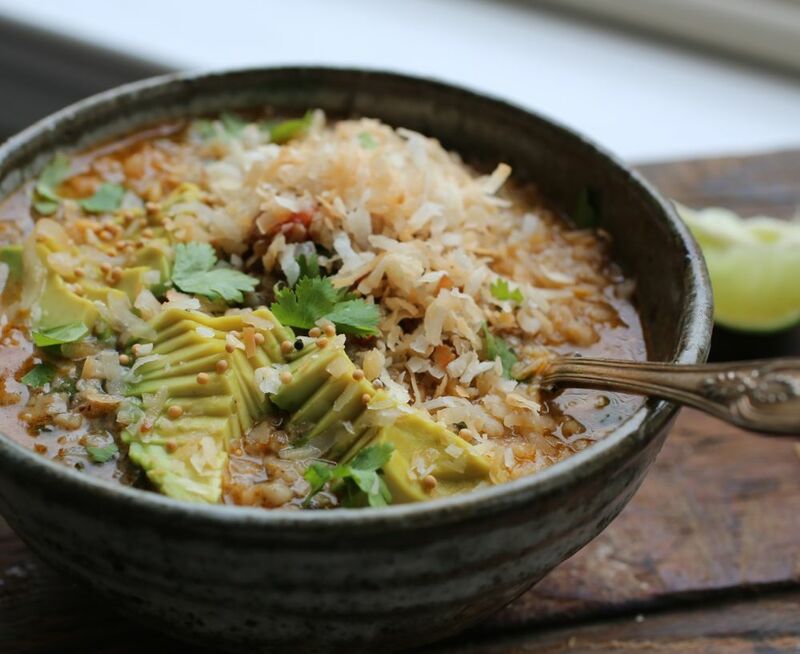 Although I love my daal spicy, when I make this dish for my family, I add little or no chile pepper so my husband and toddler can enjoy it too. Even without the heat, it’s still flavorful and delicious. Yes, it’s that good. And, what’s great is that leftovers taste even better the next day. Palak daal is traditionally served with roti or rice, but for variety I sometimes serve it with other grains such as farro, couscous or pearled barley. avocados, sliced and dressed in olive oil, lime juice, and salt. Rinse daal with cold water until murky water becomes clear. Drain and set aside. In a large pot over medium heat, add coconut oil. Then add cumin seeds and mustard seeds and fry until they begin to sizzle and pop. Add onions and sauté for about 10 minutes. Then add the garlic, ginger, chile and garam masala. Stir well. After a few minutes, add the tomatoes and red chile powder, if using, and cook for about 3-5 minutes. Add daal, 4 cups (about a liter) water, and turmeric. Bring to a boil then allow to simmer until lentils are very soft, 1-2 hours. Add salt. The consistency should be thick, but still soupy. You may need to add a little more water, or if you think you have too much liquid/sauce, you can increase the heat to a rapid boil for a few minutes to reduce it. Under low heat, and spinach. Give it a good stir then add coconut cream or milk, if using, and lime juice. Taste adjust seasoning, adding more salt if necessary. 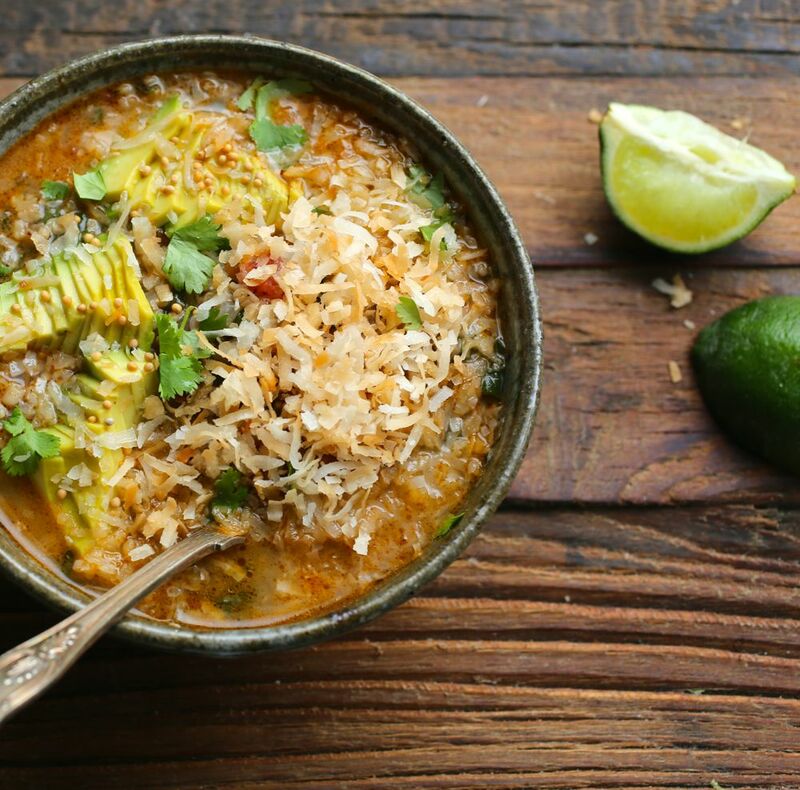 Remove from heat and serve with toppings of choice—coconut, mustard seeds, cilantro and/or avocados. Notes: If you would like to use asafetida, cook the lentils with turmeric first. After the lentils have softened, about 1-2 hours, add salt. Then, in a separate pan heat oil and sauté the cumin, mustard seeds and a pinch of asafetida. Then add the onions, garlic, ginger, green chile, and garam masala and sauté about 10 minutes. Add this daal, then add spinach, coconut cream and lime juice. Taste and adjust for salt. A couple of things about spinach. I prefer to add it towards the end of cooking because I like the color to remain vibrant. Also, when it comes to eating spinach, it is best to eat it with citrus as that helps with iron absorption. I’ve used both lime and lemon juice when making palak daal. Both taste great, although slightly different. This is such a beautiful dish. . .full of gorgeous color and texture. I especially love that you topped it with avocado to give it additional depth. Stunning! Hi Lynn, thank you for your kind words! Happy you like the added color and texture! Oh my Lord, all these ingredients on one plate has to be heaven! I think so! 🙂 Thank you Brenda! Oh my goodness this looks so tasty, just love your pictures,wow congratulations!! Sooo good! I made this tonight for dinner, and I love it! The flavors are delicious. 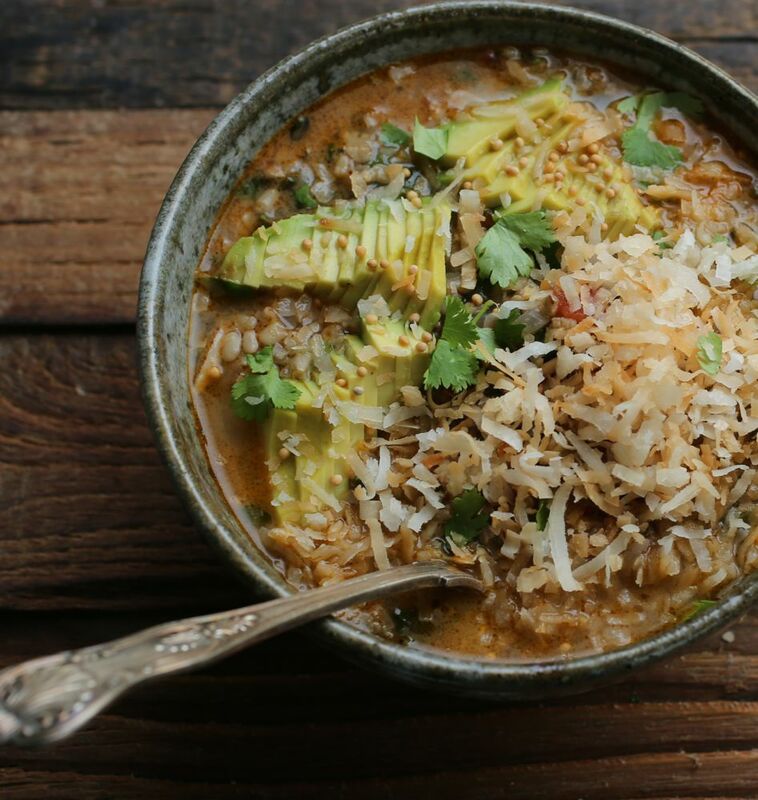 The avocado and toasted coconut make great toppings. My new favorite dish. Thank you!! Awesome! You are very welcome! Glad you tried and liked it! Thanks for letting me know!!! If you want, also try the daal makhani. It’s also delicious! Thanks again!